Gamelan is the cultural products to meet the needs of human art. Artistry is one element of a culture that is universal. This means that every nation has a certain artistry, however his form differs between Nations that one with the other. When the contact occurredamong Nations cultural arts then also join contact so it can happen one nation will absorb or mengarn when the elements of the artof other Nations adapted to the conditions of seternpat. Therefore,since the existence of the gamelan until now has taken place changes and developments, particularly within the thoroughness ansambelnya. instrument with a tone of pentatonis, consisting of: Kendang, Bonang, Bonang Penerus, Demung, Saron, was Peking (Gamelan), Slenthem & Kenong, Gong, Gender, Gambang, Siter, Rebab, Suling. The word itself is derived from the Gamelan of Java "gamel" which means playing the hit/, followed by the suffix "an" which makes it as a noun. While the term gamelan has the meaning as one musical instrument that is played with. There is no clarity about the history of the creation of this instrument. However, the gamelan is estimated to be born at the time of the culture outside of the Hindu - Buddhism dominated Indonesia. Although there are differences in its development with the music of India, still there are some traits that are not missing, one of them is how to "sing" the song. Singer man commonly referred to as wiraswara and female singers called waranggana. According to Javanese mythology, gamelan created by Sang Hyang Guru in Saka Era. He is the God who rules over all the land of Java, with a Palace located on the mountain of Medangkamulan in the area of Mahendra (now mount Lawu). Gamelan musical instrument that was first created is "gong", which is used to summon the gods. 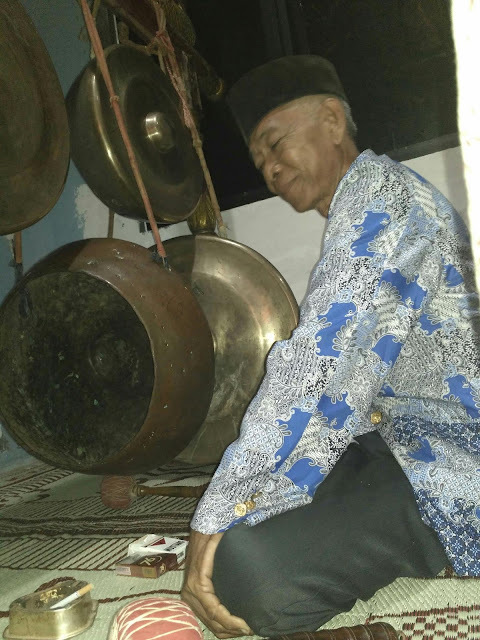 After that, to deliver a special message, Sang Hyang Guru re-create some other equipment such as two gongs, until finally making a set of gamelan. At the time of Majapahit, gamelan music is an excellent progression until it reaches the form like this and now scattered in several areas such as Bali and Sunda (West Java). The first authentic proof on the existence of gamelan music found in Borobudur, Magelang, Central Java dating from the 8th century. On his relief look few appliances such as bamboo flute, bells, kendhang in various sizes, lute, stringed musical instrument playing and learned, including a bit of the description of element a metal instrument. 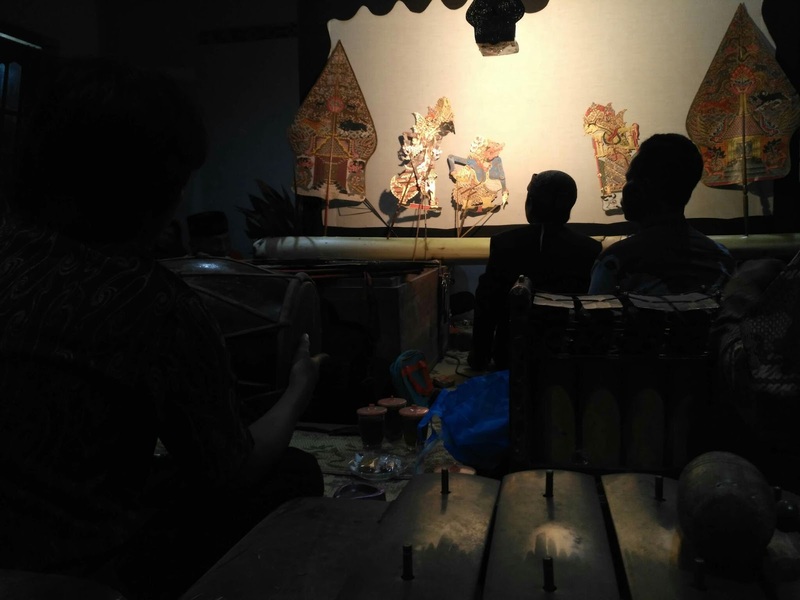 Further development of gamelan, used to accompany wayang performances and dances. Until it finally stands as its own music and comes with the sound of the sinden. Gamelan in Java, is a little different with the Gamelan of Bali or Sundanese Gamelan. Javanese gamelan has softer tones when compared with Balinese Gamelan harmony as well as the Sundanese Gamelan in 2009 and dominated the sound of flutes. According to some research, the difference is a result of the disclosure against the view of life "Java people" in General. The view in question is: as of Java should always "maintaining the harmony of physical and spiritual life, as well as alignment in speaking and acting". Therefore, the "Java people" always avoid expression that explosiveness and always try to embody the tolerance. The most obvious form in gamelan music is the pull of the rope the rebab is being balanced sound alloy, kenong, saron kendang and gambang and the sound of the gong at the closing of each rhythm. Tuning and the making of the gamelan is a very complex process.The gamelan uses four ways of tuning, i.e. "sléndro, pélog", "Author" (specifically the area of Sunda, or West Java), and "" madenda (also known as diatonic melodies), a minor scale is the same as the original that is widely used in Europe. * Slendro has 5 tones per octave, namely: 1 2 3 5 6 [C-D E + G A] with small interval difference. * Pelog has 7 melodies per octave, namely: 1 2 3 4 5 6 7 [C + D E-F # G # A B] with a big interval difference. Gamelan music composition created with some rules, which consist of several rounds and pathet, confined by one Gong and the melodies were created in a unit that consists of 4 tone. 0 Response to "Gamelan Of Java Indonesia"